The Tour of Britain will be passing through near the coast Friday round about lunch time. You will know it's approaching when you hear the helicopter, expect it to flash past and best not to get in the way. Wednesday the day before there's an individual time trial around Clacton, if you download the start sheet you'll know who's likely to be coming along next and there will be several hours of spectating to do. Snape exile now Sidmouth resident Roger Horton emailed with some kind words and help with the recent Snape postcards on our Facebook page. Thank you Roger. It's certainly the village fete season, Saturday we went to the Wrabness fete which is pretty much a mini festival. We enjoyed fish curry, a very theatrical human fruit machine, a bird of prey that decided to go off for a 15 minute fly round and a woman singer who might be Jackie Hole of The Super Things ... more near the coast it's Blaxhall's turn to fete this coming Saturday. Wrabness on the south bank of the river Stour is Essex if only just. 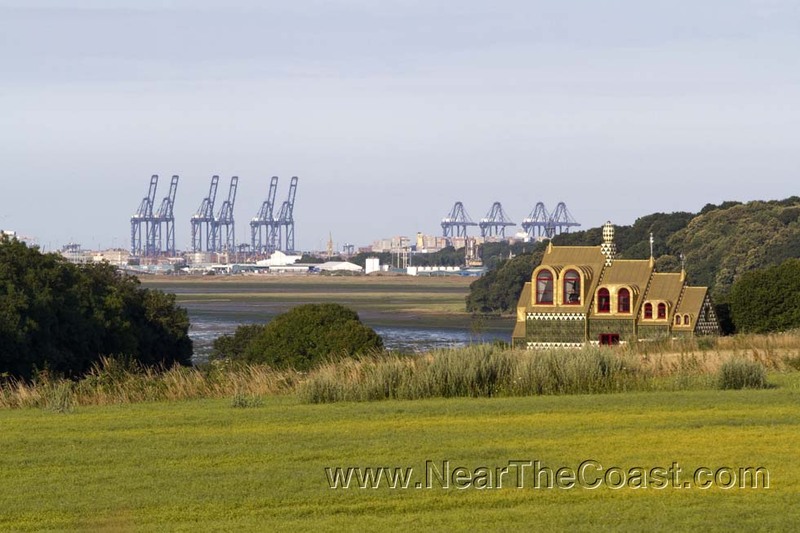 From there you can see Grayson Perry's A House for Essex against the cranes of Felixstowe port. From what we can make out Perry doesn't actually own the house ... can't say we're smitten. The weekend before last we saw Bury Saints beat Solent Thrashers 19-6 at home. A scrappy match that in the spirit of Shakespeare's anniversary might be described as a Comedy of Errors. For us the most surprising moment was when the visiting defensive coach was warned for unsportsmanlike conduct because one of his hand signals to his own players could be interpreted as threatening (NFL Rules Section 3 Article 1b). This Sunday the Saints play the Herts Cheetahs, free admission.